We find it necessary to write this letter to you concerning Senate Bill 2109, “Navajo and Hopi Little Colorado River Water Rights Settlement Act of 2012”, to instruct you that you must immediately direct Hopi Chairman Leroy Shingoitewa, Council Representative George Mase, and certain members of the Hopi Water & Energy Team, to stop any further negotiation of S.2109 (and H.R. 4067) and the Settlement Agreement. On June 15, 2012, at a duly constituted Hopi Tribal Council meeting held at the Youth/Elderly Center in the Village of Hotevilla, the Hopi Tribal Council voted, 11 for, and 4 against, to approve Action Item No. H-065-2012, which resulted in the passage of Resolution H-072-2012 (copy attached for your reading). Voting for passage were: Vice Chairman Herman Honanie, Davis Pecusa (Bacavi), Gayver Puhuyesva (Bacavi), Nada Talayumptewa (Kykotsmovi), Carlene Quotskuyva (Kykotsmovi), Rebekah Masayesva (Kykotsmovi), Danny Honanie (Kykotsmovi), Bruce Fredericks (Upper Moenkopi), Leroy Sumatzkuku (Upper Moenkopi), Wayne Kuwanhyoima (Upper Moenkopi), Danny Humetewa (Upper Moenkopi). Voting against were Alph Secakuku(Sipaulovi), George Mase (Sipaulovi), Cedric Kuwaninvaya (Sipaulovi); and Leroy Kewanimptewa (Bacavi). 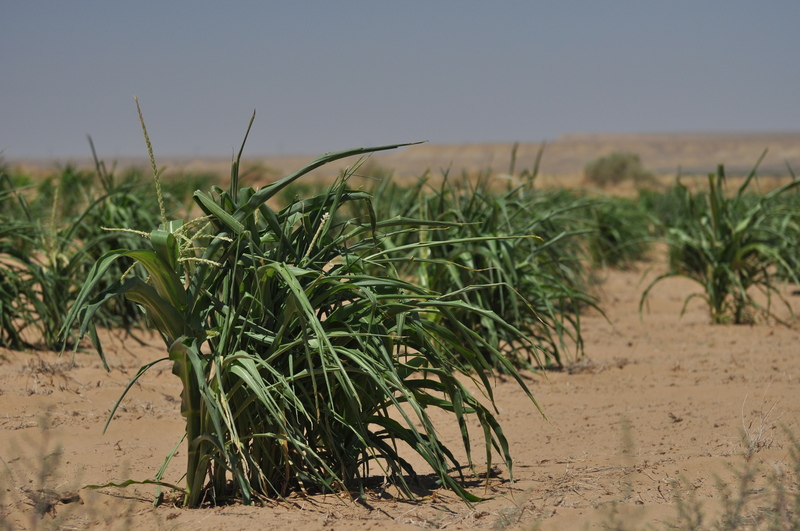 Resolution H-072-2012 rejected S.2109; and directed Chairman Shingoitewa and the Hopi Water & Energy Team to cease any further negotiation of S.2109. The Resolution also directs Hopi Chairman Shingoitewa to formally notify Senator Jon Kyl and appropriate departments of the Federal government of the Hopi Tribe’s rejection of S.2109. Our villages, traditional leaders and tribal members overwhelmingly rejected S.2109. They issued village proclamations and resolutions, and wrote letters stating their rejection of S.2109. We attach copies for your reading. At the June 15, 2012 tribal council meeting, there was unanimous opposition to S.2109 by our villages, traditional leaders and tribal members. Not one village, traditional leader, and tribal member spoke in favor of S.2109. The mandate of the Hopi Senom is very clear, yet Hopi Chairman Leroy Shingoitewa, George Mase and certain members of the Hopi Water & Energy Team continue to negotiate S.2109 and its accompanying Settlement Agreement. Other council representatives are also supporting and are facilitating these negotiations. 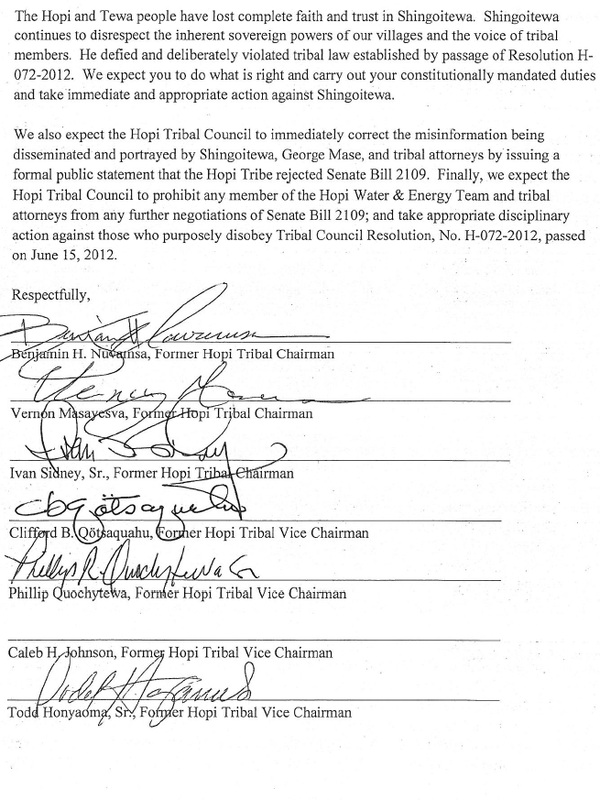 This is an outright violation of H-072-2012 and constitutes “gross neglect of duty” by Shingoitewa, Mase and certain members of the Hopi Water & Energy Team, and other tribal council representatives who are supporting Shingoitewa’s continuing negotiations. As members of the Hopi Tribal Council, you are allowing the illegal spending of millions of the tribe’s money (our money) on attorneys on this illegal activity by your failure to stop Shingoitewa and Mase. You are allowing Shingoitewa, Mase and others to spend money illegally on their trips to meet with the Department of Interior officials and other LCR negotiating parties. All expenses beginning June 15, 2012, to continue negotiating S.2109 and the Settlement Agreement are improper and illegal. The authority to negotiate village water rights under S.2109 is authority that is not granted to the Hopi Tribal Council by the Constitution & By-Laws of the Hopi Tribe. Thus, Leroy Shingoitewa, George Mase and certain members of the Hopi Water & Energy Team do not have the authority to be negotiating S.2109 and the Settlement Agreement. Moreover, Resolution H-072-2012 specifically prohibits Leroy Shingoitewa, as Tribal Chairman, and the Hopi Water & Energy Team from any further negotiations of S.2109. We encourage you to study the attached Resolution H-072-2012, particularly the second recital. It points out your duties and obligations as tribal council representatives as mandated by the Hopi Constitution. Also study the By-Laws of the Hopi Tribe, at ARTICLE I – DUTIES AND QUALIFICATIONS OF OFFICERS, Section 3, where it requires you, as tribal council representatives, to “truly represent the people of their villages”. We also remind you of the Hopi Appellate Court’s Final Answer to the Bacavi Village Certified Question. In answering Bacavi Village’s Certified Question, the Court spoke to the authorities of our villages. 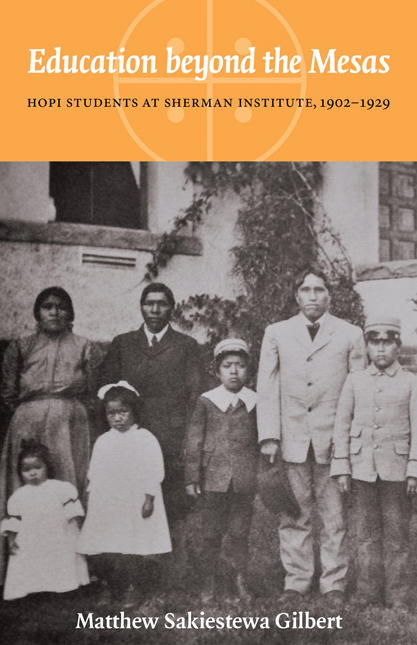 The Court said “(p)rior to the initial drafting and adoption of the Hopi Constitution in 1936 there was no central Hopi government. Rather, the people comprising the Hopi Tribe lived in 12 self-governing Villages, each of which retained its own aboriginal sovereignty”. The Court also said “the entire structure of the Hopi Constitution indicates that the authority of the central government rests on the bedrock of the aboriginal sovereignty of the Hopi and Tewa villages”. The Hopi Tribal Council operates on the limited authorities granted it by the villages; and any authority not specifically included in the Hopi Constitution is authority retained by the villages. The authority to negotiate village water rights is authority that has not been granted the Hopi Tribal Council by the villages. We are aware of meetings being held and attended by Chairman Shingoitewa, George Mase, certain members of the Hopi Water & Energy Team, and their attorneys. We are aware of the scheduled November 14, 2012, meeting with Department of Interior Secretary Ken Salazar in Washington, D.C. We are also aware that certain representatives of the villages of Mishongnovi, Sipaulovi and Upper Moenkopi plan to attend this meeting in Washington, D.C.
We recently obtained a copy of proposed revisions to S.2109 that has been the topic of illegal negotiations by Shingoitewa, Mase and certain members of the Water & Energy Team. While the Navajo Nation Council committees shared this document with its constituents for their comment, Leroy Shingoitewa, George Mase and certain members of the Hopi Water & Energy Team found it convenient to keep this document secret and not share with Hopi villages and tribal members. You will recall we had to go to other sources to obtain a copy of the original S.2109. It is clear that the Hopi Tribal Council does not have authority to negotiate S.2109 and the Settlement Agreement. And by majority vote in enacting Resolution H-072-2012, you directed Chairman Shingoitewa and the Hopi Water & Energy Team to cease any further negotiations of S.2109, but to date, they have defied your legislative mandate. Therefore, we want you to direct Chairman Shingoitewa, George Mase and the Hopi Water & Energy Team to stop any further negotiation of S.2109 and the Settlement Agreement. This is your duty and obligation to our villages and members of the Hopi Tribe. We also want you to cancel Chairman Shingoitewa’s, George Mase’s, and certain tribal representatives’ trip to attend the November 14, 2012 meetings in Washington, D.C. Finally, we demand that you direct that letters be written to Senator Jon Kyl, Senator John McCain, Senator Daniel Akaka, and Representative Benjamin Quayle, to withdraw S.2109 and its companion bill, H.R. 4067, with copies of the letters to Interior Secretary Ken Salazar. 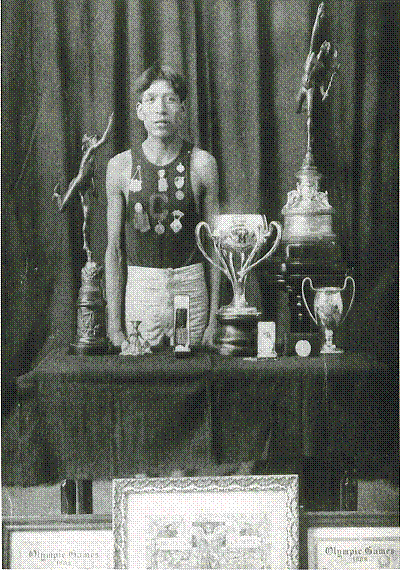 We fully expect that you will comply with our demands and respect the will of the Hopi Senom. Your failure will constitute your “serious neglect of duty”; and may require further legal action. 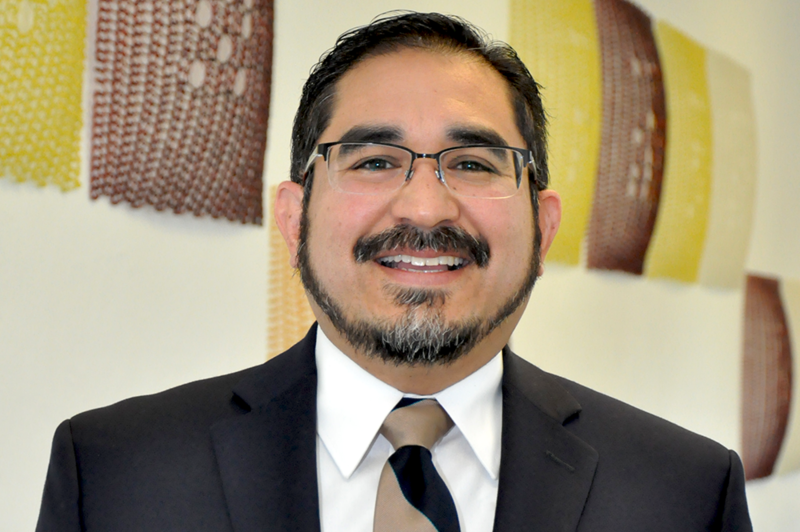 /s/ Phillip R. Quochytewa, Sr.
/s/ Todd H. Honyaoma, Sr. There was overwhelming objection to and rejection of Senate Bill 2109 by our villages and tribal members, yet Shingoitewa has purposely and deliberately refused to listen to the Hopi and Tewa people. Instead, he signed Resolution H-073-2012 passed illegally on June 21, 2012 which endorses Senate Bill 2109 over our objections. Action Item H-053-2012 was sponsored by Sipaulovi Village Representative George Mase to endorse Senate Bill 2109, which resulted in Resolution H-073-2012. Resolution H-073-2012 is not the official position of the Hopi and Tewa villages and tribal members regarding Senate Bill 2109. Even if Shingoitewa refuses, or otherwise fails to sign Resolution H-072-2012, he does not have the constitutional authority to veto a lawful action of the Hopi Tribal Council. Therefore, this Resolution is in full force and effect, and has the force of tribal law. 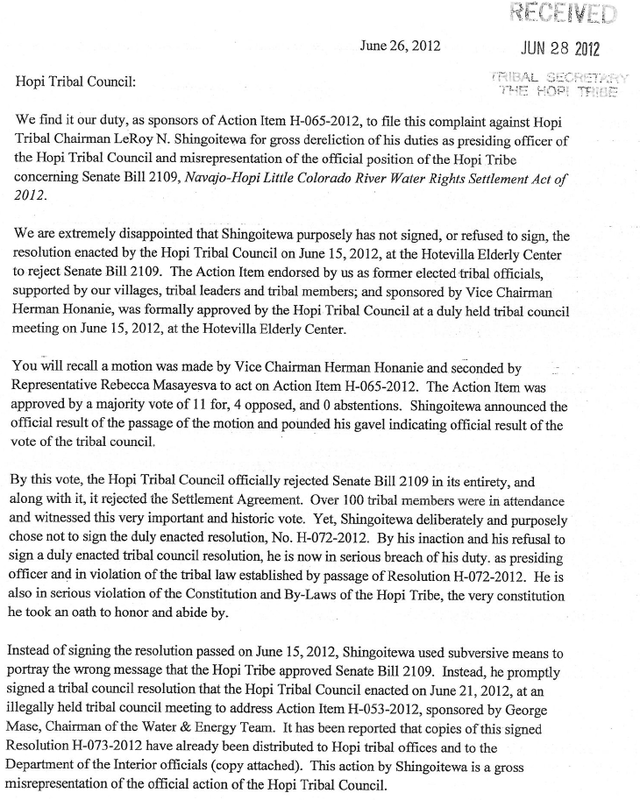 If he continues to not sign this Resolution, by this letter, we have implored the Hopi Tribal Council by the attached complaint, to take immediate and appropriate action against Shingoitewa for contempt of tribal council action and for his failure to uphold his duty and obligation as presiding officer of the tribal council, including immediate removal. A copy of this complaint has been sent to the Hopi Tutuveni for publication, and to other local and national news media. 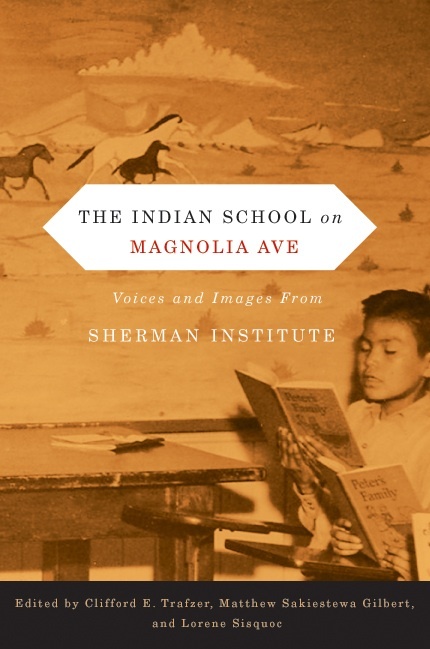 We asked that this complaint be published in full, unedited text so that all tribal members and the general public can be informed of this matter. Please disseminate copies of the complaint letter to your fellow tribal members. Thank you.